Our understanding of stellar processes is based upon our understanding of our Sun. We have studied the processes in the Sun and with astronomical observations developed models of how stars are born, live and eventually die. If our understanding of the sun is incorrect then so too would be out models of how stars develope. In the early 1970s measurements of neutrino flux from the Sun seemed to suggest that our understanding of the processes in the Sun were incorrect. This was of great concern to astronomers and sparked what was called the Solar Neutrino Problem. The problem was that some of the predicted neutrinos were missing. For more that 30 years physicists and astronomers worked to solve this problem. Results were checked and rechecked. Various experiments were conducted using several techniques. However, initially they all found that solar neutrinos were missing. It was not until 2001 that the missing neutrinos were found and were not missing at all; we were just looking in the wrong place. Neutrinos are sub-atomic particles that have no charge and due to there nature they interact weakly with other matter (NOBweb.) As we will soon see neutrinos are released when certain nuclear reactions take place in the core of the Sun. The Sun produces neutrinos at such a prodigious rate that 100 billion of them pass through an adult’s thumbnail every second (NOBweb.) However, they interact with matter so weakly that a single neutrino has a one in 100 billion chance to interact with matter as it passes through the Earth. The low probability of a neutrino interacting with matter makes measuring them difficult. At the commencement of the first solar neutrino experiment the standard particle model stipulated that neutrinos had no mass. Observations have shown that the Sun is not becoming significantly hotter and cooler. This leads us to the conclusion that all heat generated in the Sun is radiated away at the same rate as it is produced. Also, the temperature increases with depth due to the known fact that compressed gasses become hotter. The temperature increases with depth but is constant at each depth. This is the equilibrium state. Hydrostatic equilibrium is indicated by the fast that the Sun is neither collapsing nor expanding. At any particular layer the pressure from the overlaying material, including the layer its self, is the same as the upward pressure caused by escaping energy from the nuclear fusion reactions below. Within the Sun pressure and density increases with depth, as indicated by the equilibrium state. To maintain this situation the energy generated in the sun there must be transportation mechanism. In the sun there are two mechanisms: convection and radiative diffusion. Conduction is also a possibility for the transfer of heat but it is not considered an important mechanism. It is believed that radiative diffusion takes place within the 71% of the Sun’s radius (Freedman and Kaufmann p 409 - 411.) In the upper 29% convection takes place. Solar models must take into consideration thermal equilibrium, hydrostatic equilibrium, energy production and the transportation mechanisms present in the Sun. The models must also be supported by observation of the Sun’s surface. One surface observation that has been useful is helioseismology. Helioseismology has been used to confirm certain physical propeties of the Sun. The standard solar models has given us important physical properties of the sun’s core. It shows that the density is 160 000kgm-3, has a temperature of 1.5 x 107K and a pressure of 3.4x 1011 atmospheres. With the use of the model it has been demonstrated that 94% of the mass of the Sun is within 0.5 radii of the centre and that energy production is limited to within the lowest quarter of the radius. Every second 600 million tons of hydrogen is converted to 596 million tons of helium (Miramonti, 2009.) The remaining 4 million ton is converted to energy which given that the Sun is in thermal equilibrium means that the sun’s current luminosity is 4 x 1026W. Due to the energy barriers that must be overcome before nuclear fusion can occur (ie Coulomb barriers) the rate of each of the branches are sensitive to temperature. 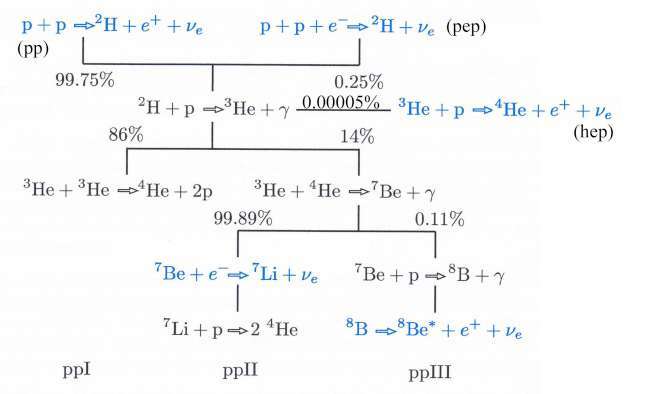 The rate of the ppII and ppIII branches can be determined by measuring the neutrino flux from 7Be and 8B. Figure 2: Solar neutrino flux from p-p chain reactions based on the standard solar model (Bahcall and Pena-Garay, 2004) Flux units are cm-2 sec-1 MeV-1 for continuum sources and cm-2 sec-1 for line sources. Neutrinos are also produced in a process knows as pep. In this process two protons and an electron collide to produce 2H and a neutrino. This results in a neutrino with an energy of approximately 1.44MeV. Unlike the photons produced in the reactions neutrinos travel quickly out of the core and into space. This is due to them interacting weakly with other matter. The detector used a tank of 390 000L of C2Cl4 constructed in the Homestake Gold Mine in South Dakota. To negate the effects of any other solar radiation the detector was constructed at a depth of 1480m. The energy threshold for the generation of 37Ar is 814keV. At that threshold the detector was sensitive to 8B and higher energy 7Be neutrinos (as indicated in fig 2.) It also had sensitivity to neutrinos produced by the pep reaction and the CNO cycle. Due to the nature of this experiment the direction from which the neutrino arrived from could not be determined. Bahcall’s calculations predicted a rate of approximately 7.6 SNU (1 SNU = I capture/second/1036 atoms) based on the standard solar model (Haxton, 1995.) The rate measured by Davis was 2.56 SNU (Miramonti, 2009.) This rate was a third of the predicted value. This result gave birth to the Solar Neutrino Problem. Three major areas were proposed to explain the discrepancy in the theoretical and observed neutrino captures in Davis’ detector. Bahcall checked and refined his model for neutrino production and capture and found no significant errors. Likewise, Davis tested his detector in a number of ways and increased its sensitivity and he found no significant errors. The third was not taken seriously at the time when Bruno Pontecorvo and Vladimir Gribov proposed that neutrinos were not fully understood. The detector utilised 4500 tones of highly purified water and photomultiplier tubes (PMTs) to measure Cherenkov radiation (Haxton, 1995.) In this experiment the Cherenkov radiation was the light emitted as an electron recoils after a neutrino – electron collision due to it having a velocity greater than the speed of light in water. The inner 4140 tons of water was monitored by 948 PMTs. The outer 1.5m of water served as an anti-counter and was monitored by 123 PMTs. Only the events in the inner-most 630 tons of water were observed to eliminate any gamma-ray events. The imaged volume is known as the fiducial volume. The Kamiokande experiment had a few advantages over the Homestake experiment. The most import of these was that the direction from which the observed neutrino had originated from could be determined. Over the course of the experiment it was clearly demonstrated that the neutrinos originated from the Sun. Also the energy of the arriving particles could determined. The spectrum of the neutrinos agreed with the predicted spectrum of the 8B neutrino spectrum. The experiment also gave real-time results. Like the previous Homestake experiment Kamiokande found that the neutrino flux was less than expected. After 1040 observing days it was found that the flux was 46% of that predicted from standard solar model (Hirata et al, 1990.) The data was checked for error but no significant errors where found. The data in the result covers two reported periods. The first from 1978 to 1988 (450 observing days) gave a result of 45%. The second period between 1988 and 1990 (590 observing days) resulted in a flux of 45% of the predicted flux. The observed number of events was higher than the Homestake experiment due to the nature of the detector. This is because the Homestake detector only had sensitivity to electron-neutrinos. The Kamiokande detector had some sensitivity to the other types of neutrinos hence the higher measured flux. As stated in the section on the standard solar section the initial stage of the p-p chain gives the rate of the overall p-p chain reaction rate. For that reason it is important to measure the flux from this reaction. The two radiochemical experiments (GALLEX and SAGE) where designed for this purpose. Like the Homestake experiment the two gallium detectors had a run of a set period and therefore were not real-time detectors. At the end of a run (about 3 weeks) nitrogen gas was pumped through the solution to extract the 71Ge. It was then converted to GeH4 and placed in the counters with xenon gas. The sample was then observed for six months. The results showed that two peaks at 10.4keV (K peak) and 1.2kev (L peak.) These where used to compare the results to natural radiation. An important feature of these detectors is that they could be calibrated by terrestrial sources (NOBweb.) The GALLEX detector was calibrated by using a 51Cr source. The original GALLEX experiment measured a flux of 77.5 SNU over 65 runs. Under GNO a flux of 65.2 SNU was measured. Combining the two the result is 70.8 SNU over 100 runs taken over 2834 observing days. The standard solar model predicts a flux of 129 SNU (Bellerive, 2003.) The measured flux was 55% of what was expected. The detector was sensitive to the same energy level and to the same neutrinos as the GALLEX experiment. The 71Ge was extracted by vigorously mixing the target with a mixture of hydrogen peroxide and dilute hydrochloric acid. This produced an emulsion where the germanium is first oxidized before being dissolved by the hydrochloric acid. The germanium is then extracted as GeCl4 which is then purified, concentrated and converted to GeH4. The extraction of the germanium is about 80% efficient. The radioactive decay of the germanium is then conducted in the same manner as in the GALLEX experiment. As with the GALLEX experiment SAGE found a neutrino flux less than that predicted by the standard solar model. The measured flux was about 64.5 SNU or approximately 50% of the predicted value. The detector contained 50 000 tons of ultra-purified water (Bellerive, 2003) that was continually purified. The outer detector provided a shield for cosmic ray muons and external low energy background. The outer detector was monitored with 1885 PMTs. The inner detector contained 32 000 tons of water with a fiducial volume of 25 000 tons. The inner detector was monitored by 11 146 PMTs. Measures were taken to minimise background events caused by radon emitted from the surrounding rock. With an energy threshold of 5MeV (for the early part of the experiment the threshold was 6.5MeV) the detector was sensitive to neutrinos resulting from the β decay of 8B. One part of the experiment was to test if there was variation in events between night and day to test a prediction that neutrinos underwent oscillation as they passed through Earth. Due to its large volume the detector provided highly accurate measurements of neutrino flux. After 1496 observing days the measured flux (2.35 x 106 cm-2 sec-1) from phase one was 46.5% of that expected from the standard solar model (Hosata et al, 2005.) The experiment also found that variations in the flux varied due to the eccentricity of the Earth’s orbit. The second phase produced similar results. The measured flux was 2.38 x 106 cm-2 sec-1 (Cravens et al, 2008.) It found that the flux appeared to be higher during night-time but uncertainties still allowed for the flux to be the same for both night and day. It differs from the Kamiokande detectors by the use of heavy-water (D2O.) The vessel holding the heavy water is surrounded by an array of 9 456 PMTs. The cavity around the detector is filled by 7 000 tons of ultra pure water providing support and shielding. For the first time the NC interactions were observed in this experiment. This was important as this interaction measures the total flux of neutrinos. These relationships show that CC interactions only take place with electron-neutrinos, ES with predominately electron-neutrinos but also with the other two flavours and NC with all neutrino types. The higher value of ΦNC over the other two interactions indicates neutrino oscillation. Furthermore the measured ΦNC was close to the predicted 8B neutrino flux (~5.05 x 106 cm-2 sec-1) by the standard solar model (Bellerive, 2003.) This was clear statistical evidence for neutrino oscillation. This phase did not find any clear evidence for a variation between day and night variations in the neutrino flux. The SNO experiment provided the answer to the solar neutrino problem. In 1978 Wolfenstein (1978) proposed that neutrino oscillations take place within the sun. This occurs due the forward scattering of neutrinos. This could occur even if the neutrinos where mass-less. The model has been subsequently improved through the work of Mikheev and Smirnov such that the oscillations can exhibit resonance behaviour due to the propagation through matter with different densities (IPNweb.) The effect is known as the Mikheyev – Smirnov – Wolfenstein (MSW) effect. The effect is particularly strong on electron-neutrinos as they can propagate ‘while having charged-current [CC] interactions with electrons in addition to the neutral-current [NC] interactions.’ However, this process is only significant at higher neutrino energies (NOBweb) so it didn’t explain why low energy neutrinos also appear to oscillate. At lower energies neutrinos undergo vacuum oscillation. For this to occur the different states must have finite masses (INDweb.) Neutrinos can be described in terms of their mass or by the particles that they are associated with (ie electron, muon or tau, NOBweb.) The relationship between these two descriptions are constrained in what are called mixing angles. For oscillation to occur each favour must have different masses (INDweb.) This allows for changes as a neutrino passes through a vacuum and the probability that a neutrino will oscillate is based on its energy and the distance travelled. The measurement of the mixing angle started in the SNO project and is still being refined. As we will see shortly there is a transition between the low energy mass-related oscillations and the low energy vacuum oscillations. Following the SNO experiment the nature of neutrino oscillation has been continued to be studied. The detector used in the KamLAND experiment is housed in the cavern excavated for the original Kamiokande experiment. It consists of 1 000 tons of liquid scintillator within a container immersed in non-scintillating oil and surrounded by 1879 PMTs (Araki et al, 2004.) The instrument is contained within a 3 200 ton water-Chenenkov detector to shield it from gamma rays and neutrons and indentifying cosmic ray muons. Over a period of 766 ton-years the experiment observed 258 anti-neutrino events as opposed to the predicted 365 events if there was no oscillation present (Araki et al, 2004.) Arake et al (2004) concluded that neutrino oscillation was due to MSW effect and that it corresponds directly to neutrino oscillation in a vacuum. Evidence for this comes due to the distortion of the energy spectrum of the observed anti-neutrinos. Furthermore, it eliminated all but the large mixing angle solution of MSW (LMA-MSW). The significance of this experiment is that it measured 8B neutrinos at lower energy levels than in previous experiments (Bellini, 2008.) The LMA-MSW theory dictates that at energies below 2 MeV vacuum oscillations should dominate and at energies above 5MeV matter-driven oscillations should be dominated. Between the two there should be a smooth transition. A feature of this experiment is that this could be tested. The Borexino detector is similar to the KamLAND detector. It consists of a nylon vessel containing 278 tons of liquid scintallator. The vessel is surrounded by 2212 PMTs which is contained in a 2 100 ton water-Cherenkov detector with 208 PMTs. The detector was carefully shielded to isolate it from background radiation to allow detection of lower energy events. It has an energy threshold of 2.8MeV. The nature of neutrino oscillation is still an active area of study. The K2K project used a beam of muon-neutrinos fired at the Super-Kamiokande detector 250km away (Ahn et al, 2006.) They studied the parameters of oscillation (predominantly between muon- and tau-neutrinos.) The results were consistent with oscillations observed in atmospheric neutrinos generated from cosmic rays. Work is still ongoing for the OPERA experiment which is housed in the same laboratory as the GALLEX experiment (Lutter, 2009.) Using a neutrino source originating at CERN 730 km away they are studying tau-neutrino interactions. To do this they are using a nuclear emulsion and looking at muon-neutrino to tau-neutrino oscillations. They also hope to study muon-neutrino to electron-neutrino oscillations. From our understanding of the processes that occur in the Sum we can determine the number of solar neutrinos that pass through a given area. This idea was the foundations of testing if our understanding of solar processes was correct. If we could measure the correct number neutrinos we would have direct physical proof that our models are correct. This was important as prior to the solar neutrino experiments all our modelling and calculations were mainly from observations rather than measurements. The early radiochemical experiments indicated a deficit in neutrino triggered events in the detectors. In the case of Homestake the results were about a third of what was expected due to only being sensitive to electron-neutrinos. The following water-based experiment (ie Kamiokande) resulted in about 45% due to being partly sensitive to other neutrino types. The radiochemical gallium experiments of GALLEX and SAGE where sensitive to lower energy neutrinos from the pp reaction. The results were still less than expected at 55% and 50% respectively. These experiments demonstrated that both high and low energy neutrinos were missing. The larger water-based experiment of Super-Kamiokande still found only 46% of the neutrinos expected. The missing neutrinos were a great concern to astronomers and physicists alike. The experiments were designed to test the standard solar model. However, the number of neutrinos was not as expected. The idea that the model was wrong did not fit with other observations. It appeared that our understanding of the way neutrinos behaved was not quite correct. The heavy-water SNO experiment conclusively found that indeed our understanding of neutrino physics was incomplete. The experiment found the missing neutrinos and gained insight into the processes that changed the neutrinos as they travelled from the core of the Sun to the Earth. This discovering had the implication that neutrinos were not mass-less as previously stipulated in the standard particle mode. The standard particle model had to change. Since the completion of the SNO experiment other projects have further constrained our understanding of neutrinos and how they oscillate as they travel through both matter and a vacuum. It turns out that neutrinos with energies above 5MeV are predominately changed to other types of neutrinos in matter (i.e. within the sun.) For particles with energies less than 2MeV they oscillate predominately in the vacuum between the Sun and Earth. Between the two there is a smooth transition. This behaviour is described in the LMA-MSW theory. Bahcall, J. N., Gonzalex-Garcia, M. C., Pena-Garay, C., 2003. Phys. Rev. Lett., 90, 131301. 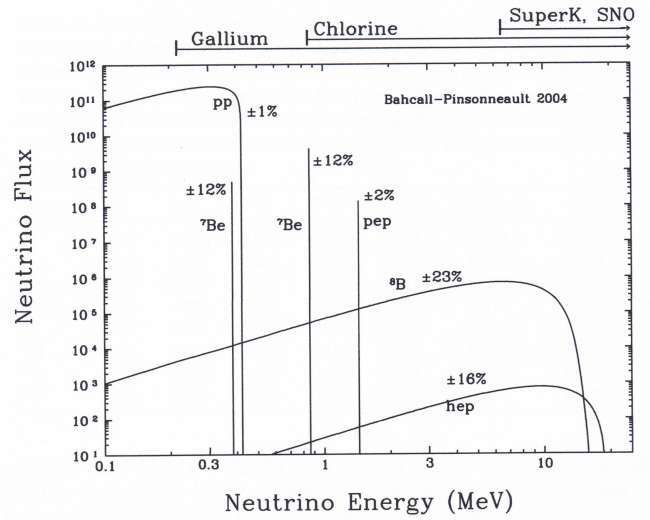 Bellerive, A., 2003. Review of Solar Neutrino Experiments. arXiv:hep-ex/0312045v1. Freedman, R. A. & Kaufmann, W. J, III. 2007, Universe, 8th ed. ; New York: W.H. Freeman & Co.
Hirata, K. S. et al, 1990. Phys. Rev. Lett., 65, 1297. Hosaka, J. et al, 2005. Solar Neutrino Measurements in Super Kamiokande-I. arXiv:hep-ex/0508053v2.